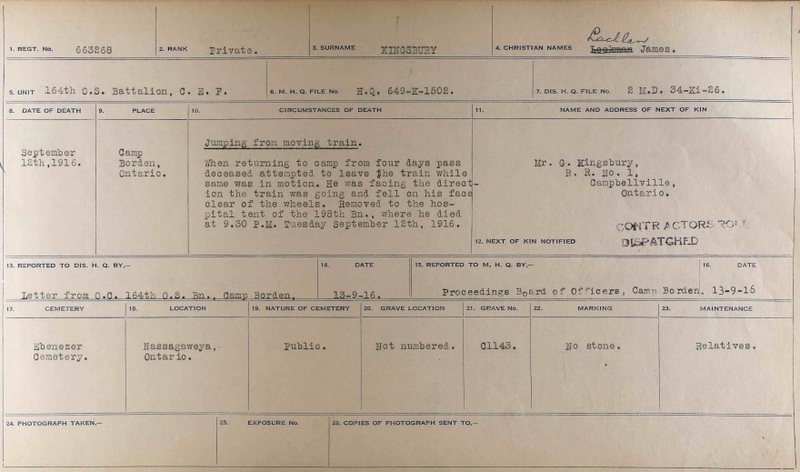 This is the story of Private James Lachlan Kingsbury #663268 who attested to the 164th Canadian Infantry Battalion on the 24th of January, 1916 in Campbellville (Township of Nassagaweya). He was the son of Gilbert and Harriett Kingsbury. As part of the “Milton Soldiers’ Project” of the Milton Historical Society, every attempt has been made to locate the burial site of each soldier that is commemorated by the Commonwealth War Graves Commission (CWGC: Kingsbury).Kingsbury is also commemorated on the Canadian Virtual War Memorial, where researchers have added additional photographs and documents (CVWM: Kingsbury). A profile of Private Kingsbury is also located on the web site of the Milton Historical Society (MHS: Kingsbury). Private Kingsbury is one of many hundred Canadian soldiers that died before they ever made it to Europe to fight in the Great War, whether from sickness, accidents or “friendly fire”. Many soldiers made it from Canada, but were similarly killed while training in England. When returning to camp from four days pass, deceased attempted to leave the train while same was in motion. He was facing the direction the train was going and fell on his face clear of the wheels. Removed to the hospital tent of the 198th Bn., where he died at 9:30 P.M. Tuesday September 12th, 1916. 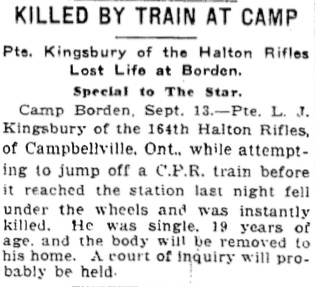 At the time of his death, the Toronto Star reported that he had been killed when he jumped from a C.P.R. train, fell under the wheels and was instantly killed. This differs from the “Official Report” noted above. 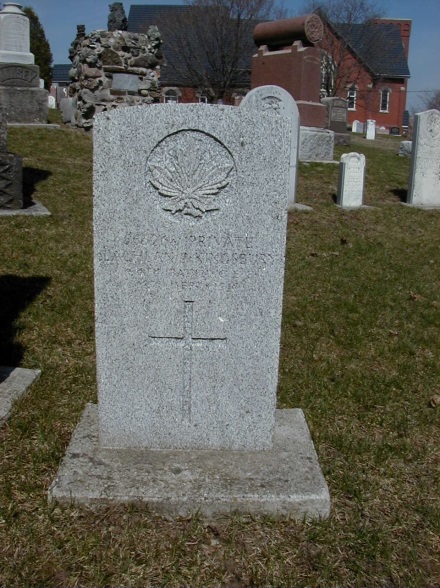 The story of Private Kingsbury is unique to Milton, as he is the only soldier of the Great War that is buried in the Nassagaweya (Ebenezer) Cemetery. His grave stone is located beside the Kingsbury family stone and is the 7th stone from Guelph Line; in the 1st row by the south fence (GPS coordinates 43°33’2.66″N 80° 4’25.22″W). The headstone for Private Kingsbury, which rests beside the family stone, was found to be in need of refurbishment or replacement. We notified the CWGC Ottawa Agency of this situation. We are pleased to now be able to report that a new headstone was installed at the Ebenezer Cemetery in September 2016. Our thanks to the CWGC for their ongoing care. 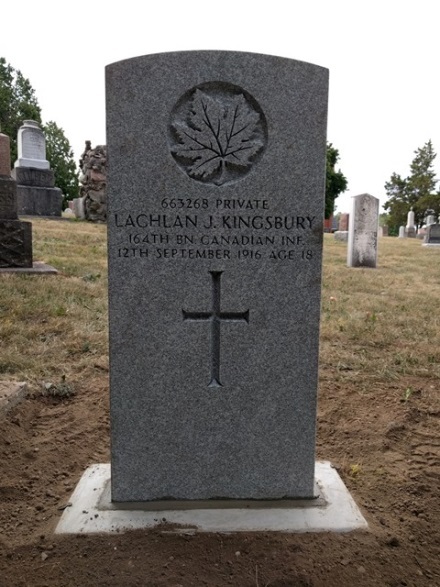 Prior to enlisting in the Canadian Expeditionary Force, James Lachlan Kingsbury was a farmer in the Campbellville area. He was only 18 years old when he attested to the 164th Battalion. From his records, we know that he was a Methodist, was 5’ 10 ½“ tall, 170 pounds, with brown hair and brown eyes. He was a big lad for that time in the CEF. The 164th Battalion was one of 260 numbered battalions that were formed Canada wide to form the infantry of the “Canadian Corps” of the Canadian Expeditionary Force, plus a few named battalions (PPCLI, RCR, and the Canadian Mounted Rifles). In addition to these there were “Canadian Troops”, which included groups such as the Artillery, Cavalry, Engineers, Supply, Transport and Medical. The men of the 164th often attested in groups, envisioning that they would serve together at the front, as part of the “great adventure”. As history demonstrated, the casualties far exceeded what was expected, and thus the vast majority of the numbered battalions were broken up to provide the much needed reinforcements at the front. The 164th was one of a very few of these numbered battalions that retained a War Diary. During the months of December 1915 and January to April, 1916, recruiting was brisk, and at the end of April, the Battalion had a strength of about 800 all ranks. From that time on it was increasingly difficult to secure men, consequently the 164th Battalion never reached full strength. On June 5, 1916, the Battalion was mobilized at Orangeville Fair Grounds, remaining there under canvas until July 6, when they were moved by train to Camp Borden. The Battalion remained at Camp Borden until October 16, 1916, and on this day they began their long trek to the city of Hamilton, Ontario for further winter training. Private Kingsbury died 7 months before the 164th Battalion sailed from Halifax for Liverpool aboard the RMS Carpathia, just 2 days after the assault on Vimy Ridge. We know from the service numbers in series 663xxx that the fellow original 164th Battalion Milton area men who died in the Great War were Melville Bonus, William Cartwright, Meacham Denyes, James Elliot, Alfred Evans, William Kerns, Stanley Lancaster, William Roberts, and Elmer Tuck. Many others were fortunate enough to survive Hill 70 and Passchendaele in 1917, and Amiens, Arras and Cambrai to Mons in 1918.